Flora Friday in Oz: The Home Garden on Black Friday. To warm to go far and too many things to do at home, so it's another 'let's see what's in the garden' on a Black Friday (Friday the 13th) episode. Banksia serrata - Old Man Banksia (native in the Sydney region). Commelina cyanea - Scurvy Weed (native in the Sydney region). The leaves of this plant were eaten by the first settlers to ward off scurvy as they had no fresh fruits. Epacris longiflora - Fuchsia Heath (native in the Sydney region). .
Angophora bakeri - Narrow-leaved Apple (native in the Sydney region). Flowers on the tree and one that's fallen in a birdbath. This was a Tulip Flowered Geranium but has reverted back to one of the parent flowers. Grevillea juniperina - Juniper Grevillea. An endangered plant local to the Sydney region. Geitonoplesium cymosum - Scrambling Lily (native in the Sydney region). Veronica plebeia - Trailing Speedwell, Creeping Speedwell (native in the Sydney region). 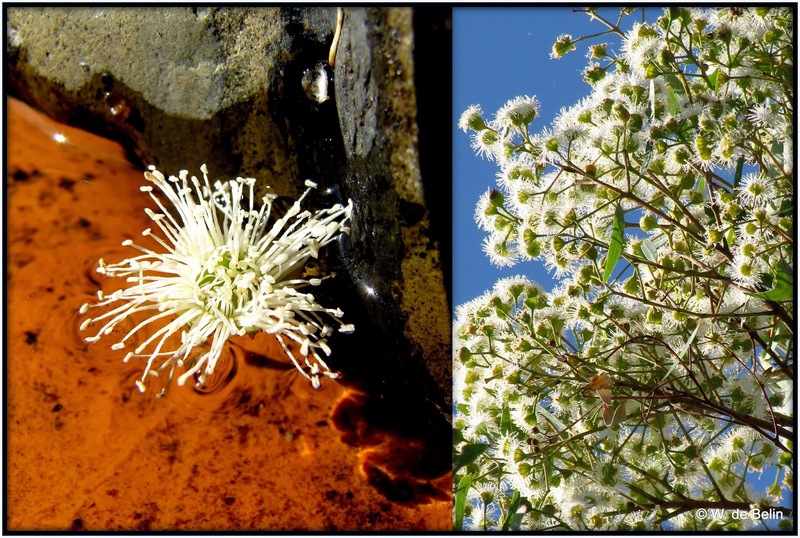 Melaleuca thymifolia -Thyme Honey Myrtle (native). Callistemon viminalis - 'Hannah Ray' (native). 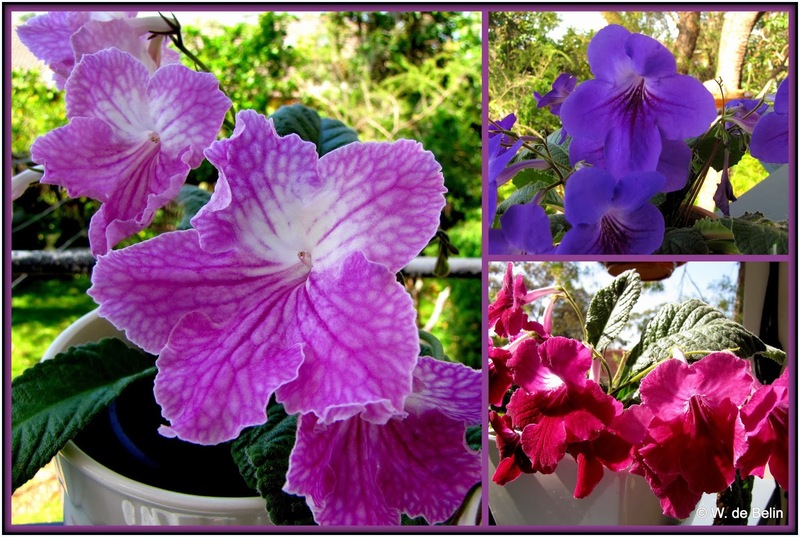 Streptocarpus - Cape Primrose (Lynn's collection). Grevillea venusta - Byfield Spider Grevillea (native). Austromyrtus dulcis - Midyim, Midgen Berry (native). Crowea exalata x salinga - 'Festival' (native). Philydrum lanuginosum - Woolly Frogmouth (native water plant in the Sydney region).. Male and female parts are fused together on this corn plant. Arthropodium milleflorum - Vanilla Lily (native in the Sydney region). Banksia robur - Swamp Banksia (native in the Sydney region). .
Justicia carnea - Jacobinia, Flamingo Flower, Brazilian Plume. Bursaria spinosa - Blackthorn, Sweet Bursaria (native in the Sydney region)..
Over looking the frog pond to 'settlers' garden in the back yard. The rest of the backyard east of 'settlers'. Don't recall seeing one of these cicadas in the yard before. Channel-billed Cuckoo, summer visitor from the north.